Help set your 4 year old up for success by using these simple tips for meals and snacks! Most 4 year olds want to be independent and explore everything! Establishing good eating habits can be much easier and simpler with just a little guidance. 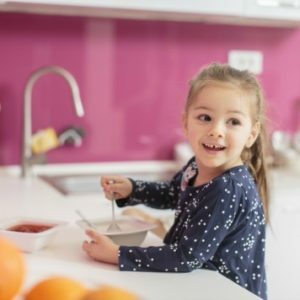 Healthful eating habits are acquired when parents focus on nurturing their child’s independent minds in a way that promotes growth and development while also encouraging healthy eating habits. By presenting healthful choices at an early stage, you allow your 4-year-old to develop decision-making skills and eating habits that they can carry into adulthood (1). Mealtime should be enjoyed together. Family meals help give your child the independence to choose from the healthy foods you provide. Growing up, my parents used mealtimes as a way for me and my sister to make our own choices, and we loved feeling like we were adults serving our own plates! Read this interview with dietitian Jill Castle for more tips on how to make mealtimes a positive experience for everyone! Here are some of my favorite combos that will please their taste buds and their bodies! Blend and serve with a side of toast with peanut butter. If there is left over smoothie, you can drink it or save it for an after school snack. In a bowl, toss sliced apples with cinnamon and walnuts and add yogurt for some tartness. To make the cream sauce, use a blender to puree 1 cup plain yogurt, sea salt, ½ lime or lemon juice, half bell pepper, ½ teaspoon garlic and onion powder. Top the tortillas with the romaine, chicken, and guacamole—drizzle the cream sauce over it and enjoy! If you’re eating these types of healthy foods with them, your kids are more inclined to eat them as well! 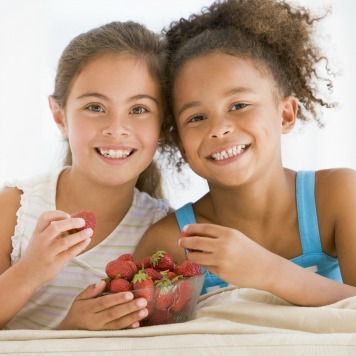 Get tips with the Healthy Kids Today activities, lesson plans and fun activities! And remember: when you offer new foods, don’t feel discouraged if they don’t like it right away. It takes several attempts before they either love it or prefer not to have it. Having patience is important! Stay on track by having a balanced diet and activity level per USDA guidelines for you and your little one.